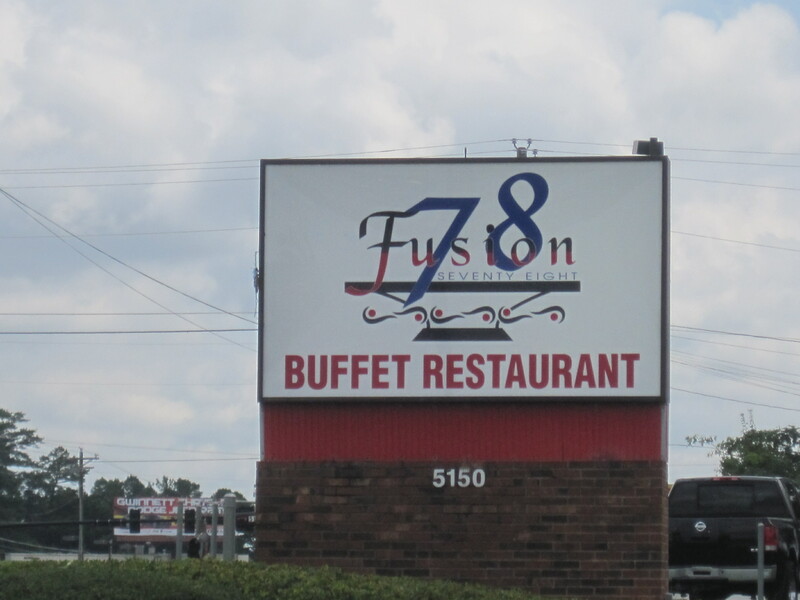 This place is an original, a Caribbean-Southern fusion buffet with food good enough to talk about. 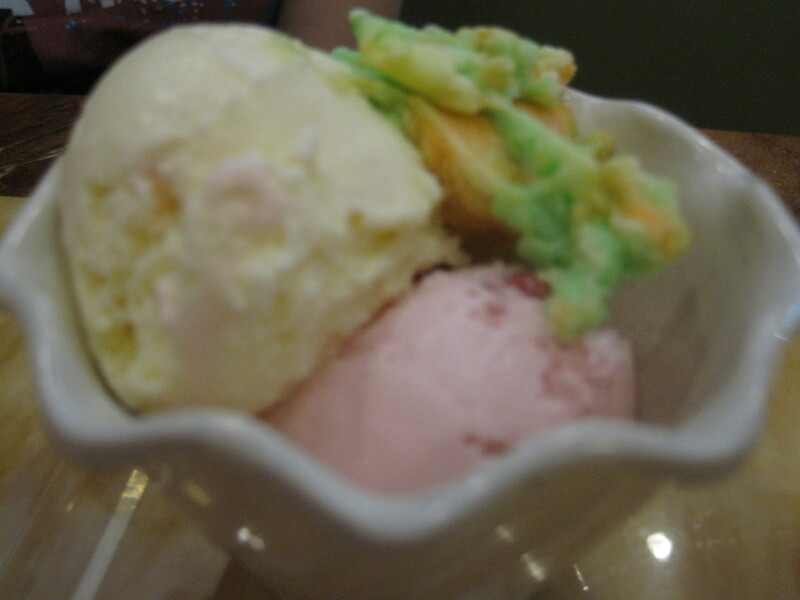 It has bits and pieces of other cuisines as well. 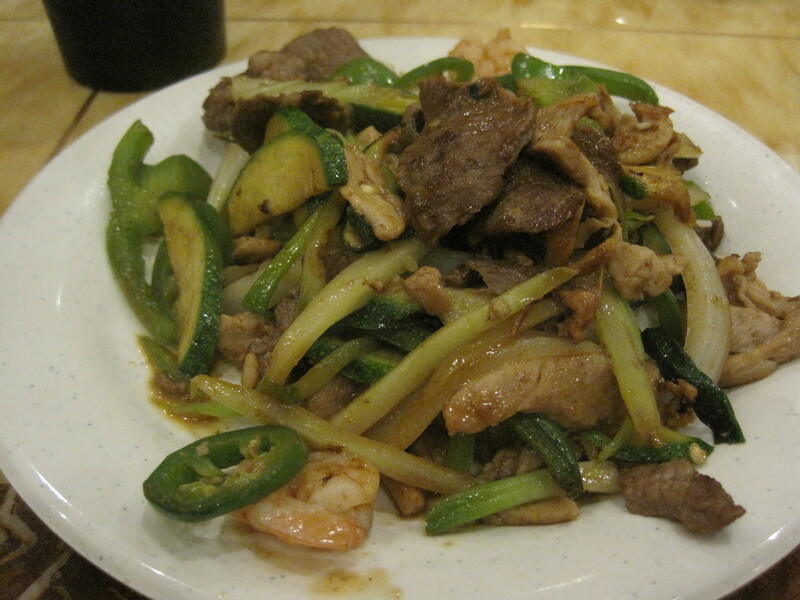 They had a General Tso’s chicken that day, and some dishes with Italian roots. It’s the Caribbean and Southern foods, however, that will keep folks coming back. 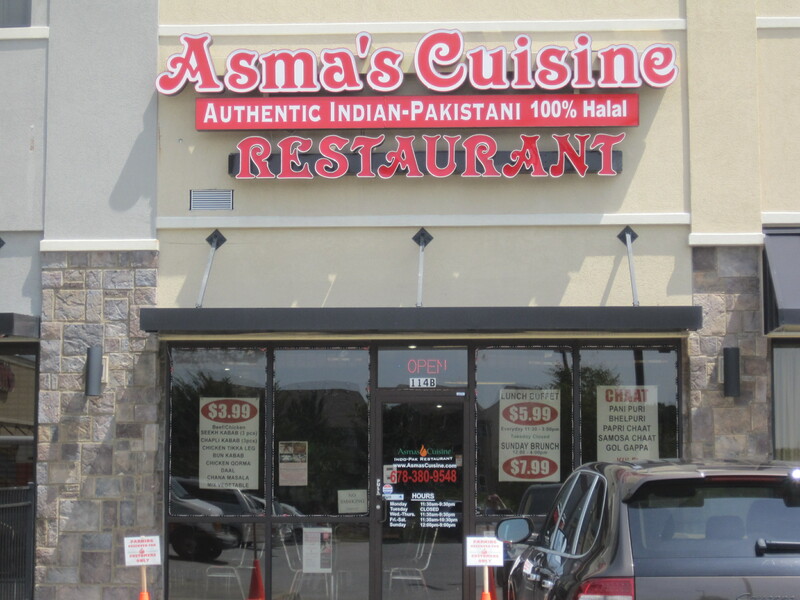 The curries here – chicken and goat, are respectable. They’re flavorful and relatively mild. 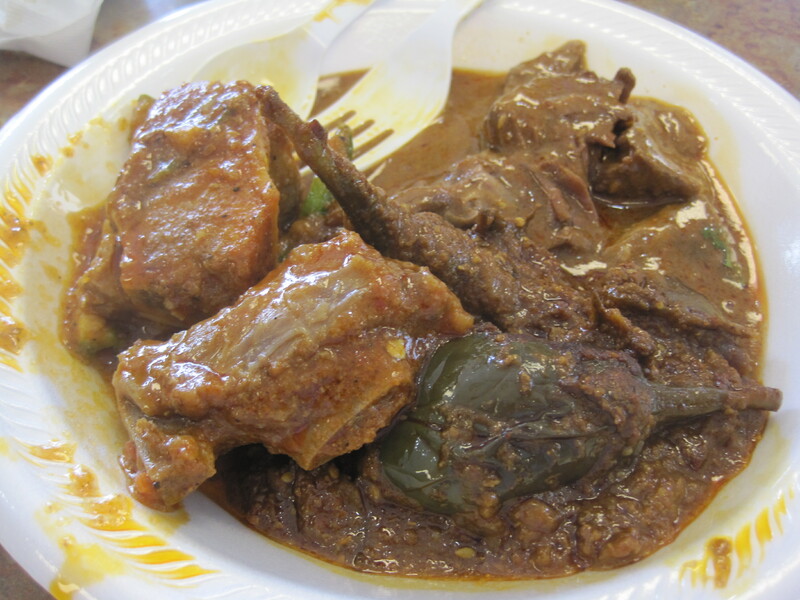 They have jerk chicken too, a good looking dish, but it doesn’t hold up to the steam the way the curries do. 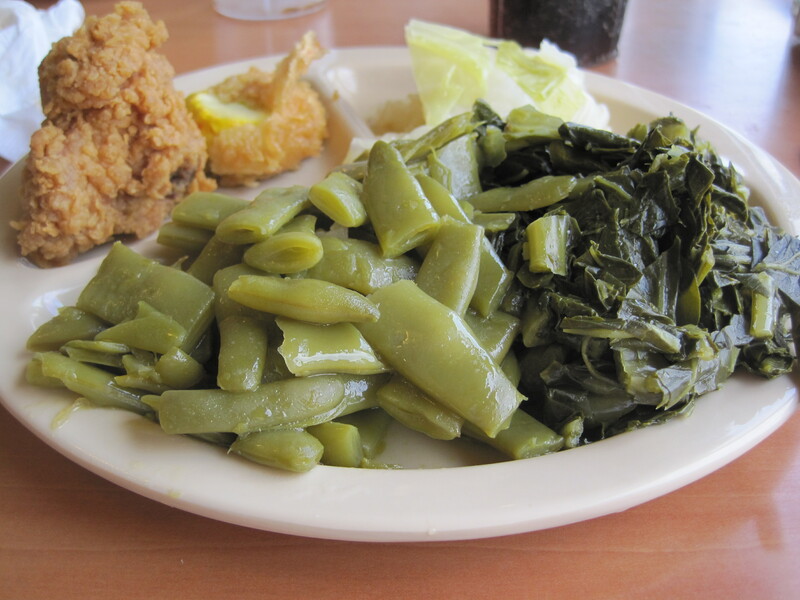 They have southern style vegetables and dishes. 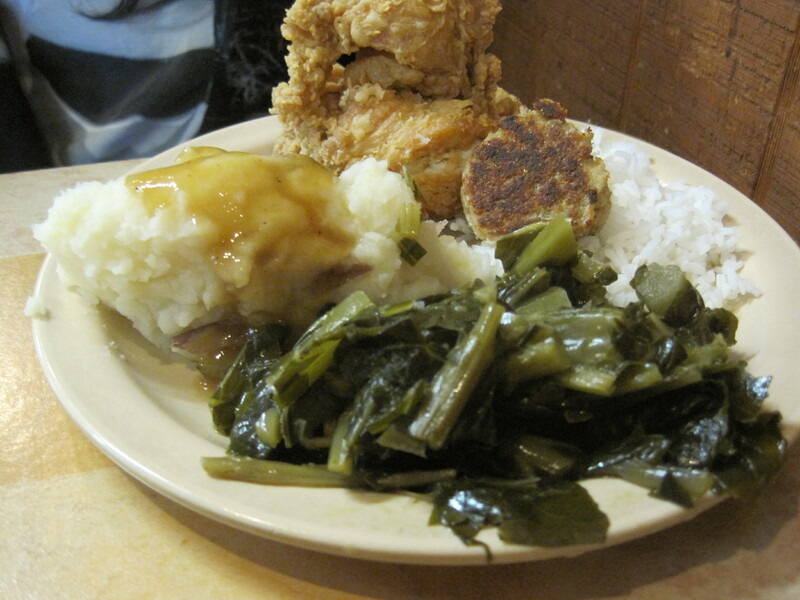 I tried collards, green beans and fried chicken. 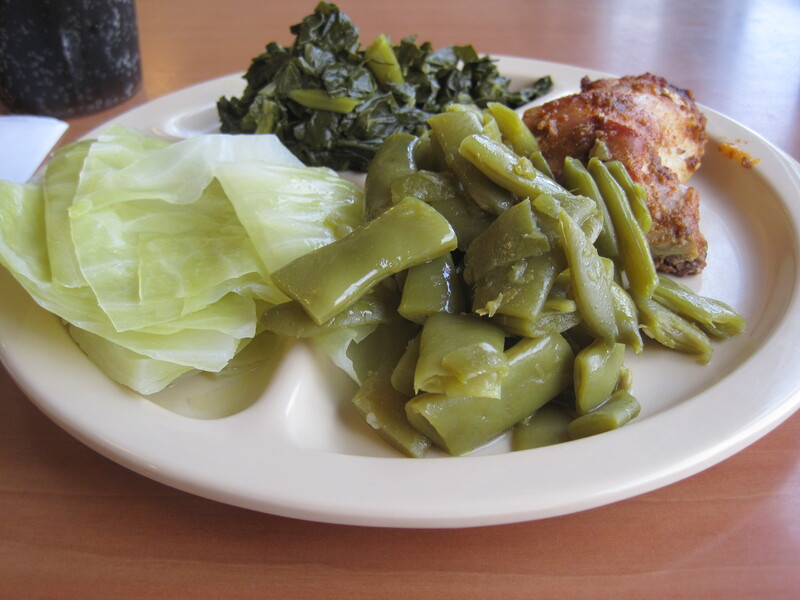 I liked the fried chicken, liked the collards, felt the green beans to be a little watery and lacking flavor. 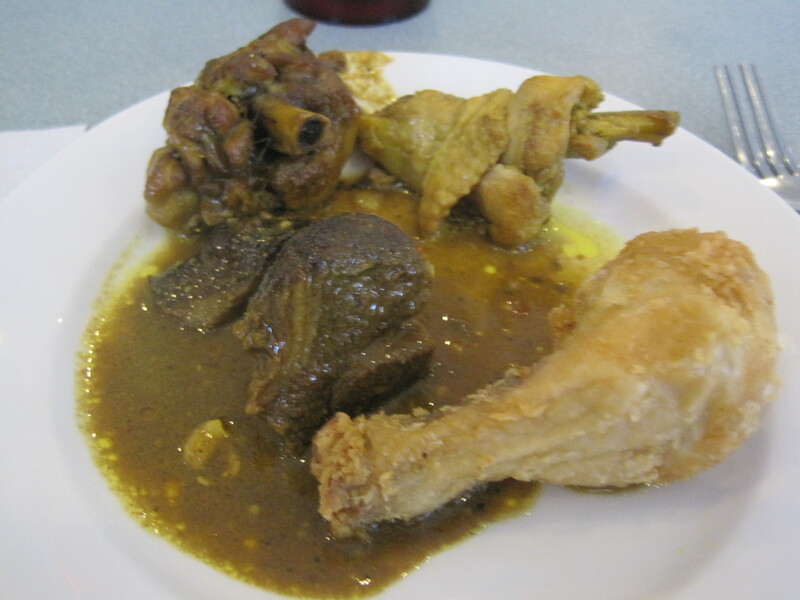 Curried chicken, curried goat, fried chicken. Still for as much curry as you can eat, for 9 dollars including drinks, for decent Southern vegetables and a bite or two of fried chicken, it should probably attract more attention than it does. It’s a relatively new restaurant and concept, so we’ll see. 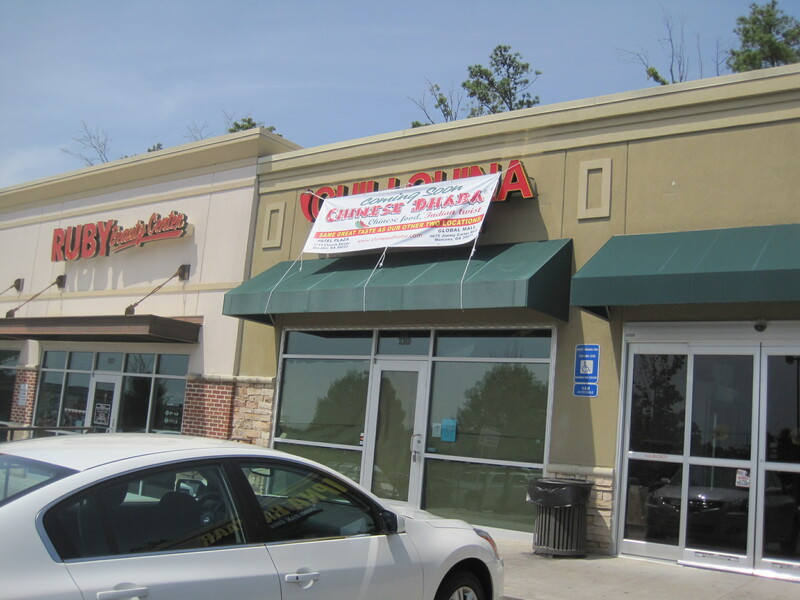 The table of grilled meats has disappeared at Atlantic in Snellville, to be replaced by a hibachi station. So what’s a hibachi station? It’s what folks in my generation used to call a Mongolian barbecue. You select a plate full of raw food, hand it to a cook, who then grills your foods. Usually you tip; a dollar is common. On return, you end up with a plate of freshly grilled meats and veggies. 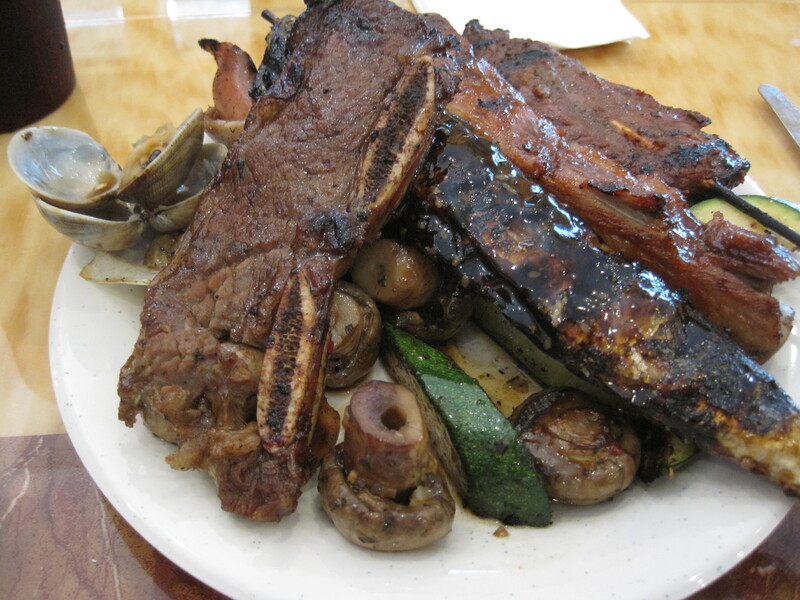 Compared to the old arrangement, an eater is much less likely to walk off with a whole plate of short ribs. And the product people would get is a lot healthier. I suspect it’s a cost saving measure. 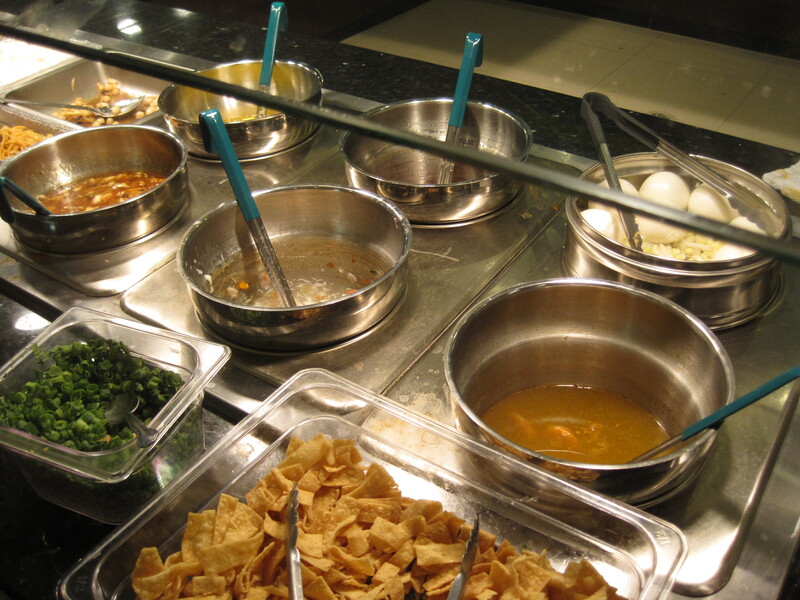 Buffets are everywhere, and managing the balance between product quality and profit is very hard. John Boys is pretty much the opposite of hot, and proof that hotness, to a certain degree, is irrelevant. This restaurant has had no entry in Urbanspoon for years, and in fact I didn’t write about it once because I couldn’t find an entry for it in Urbanspoon. It’s only when you realize that the clientele of this place couldn’t give a flip about those kinds of tools is when you get it. This place is about serving people for whom trends are never “OMG, so last week!” The selling point is simple fare, sold at a great price. 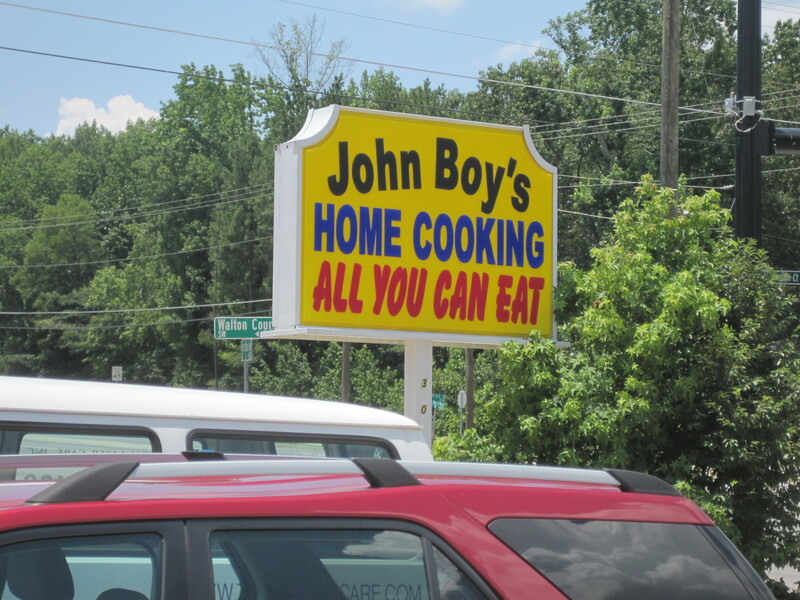 The price point for John Boy’s buffet is $7.50, about 4 dollars less than Golden Corral. As a consequence, this place is well served by an older crowd. They’re the kind of folk whose opinions won’t be given away in facial expressions. You’ll have to look at their eyes, and the corners of their lips to know how they think and feel. Or maybe, just count the numbers in the eatery. That will give you a clue. 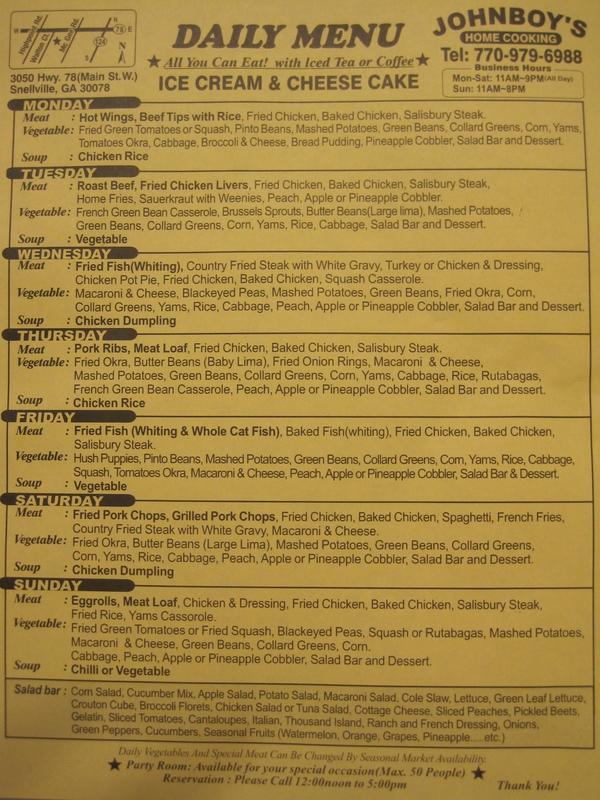 A typical weekly John Boy's Menu. This place is very comfortable for someone like me to eat. 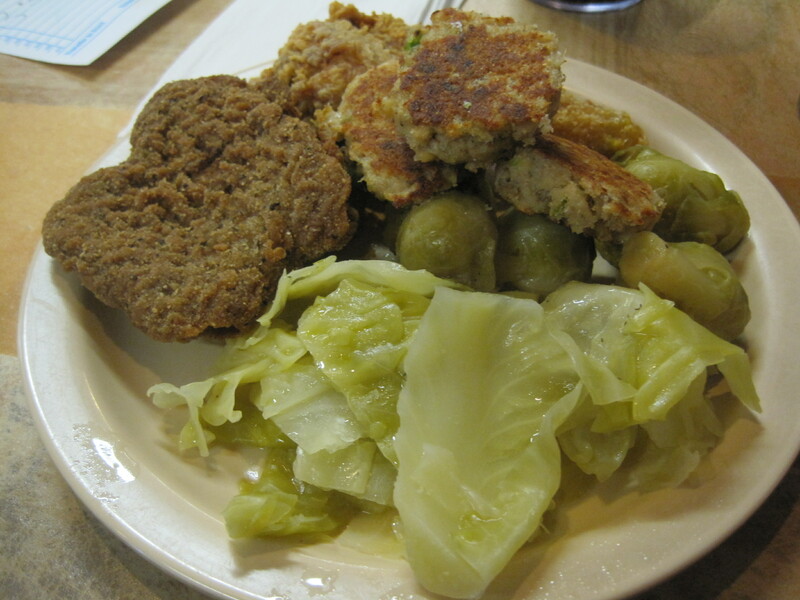 The plentiful supply of good vegetables and ample quantities of meats make this a good pit stop for a diabetic. And there are lots of families here as well, often large ones, with grown kids and mostly grown grandkids, and some patriarch at the head of his bountiful table. Now, at the price, don’t expect fancy meats or television ads. 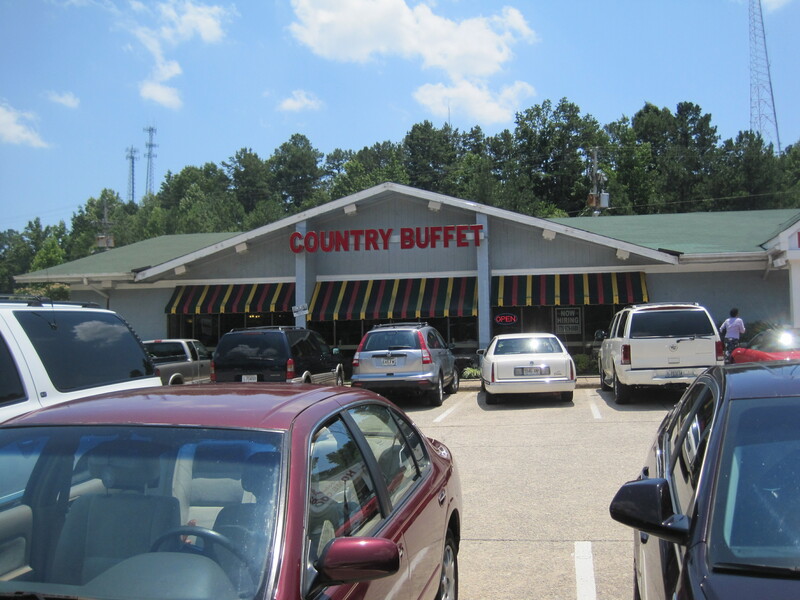 The food, however, for what they serve, is competitive with any buffet in the area. 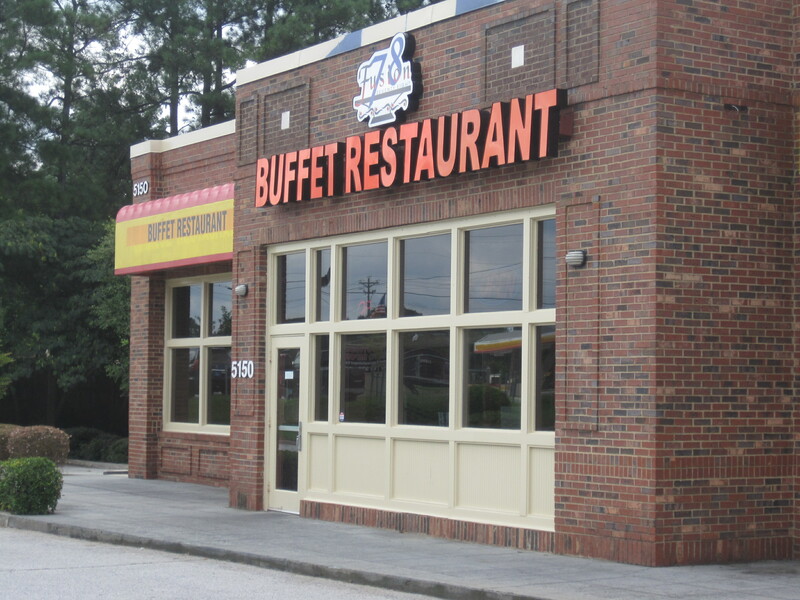 And for those who wonder what ever happened to the cafeterias of the 20th century, well, they either evolved into these modest (and critically underserved) buffets, or they perished from the face of the earth. 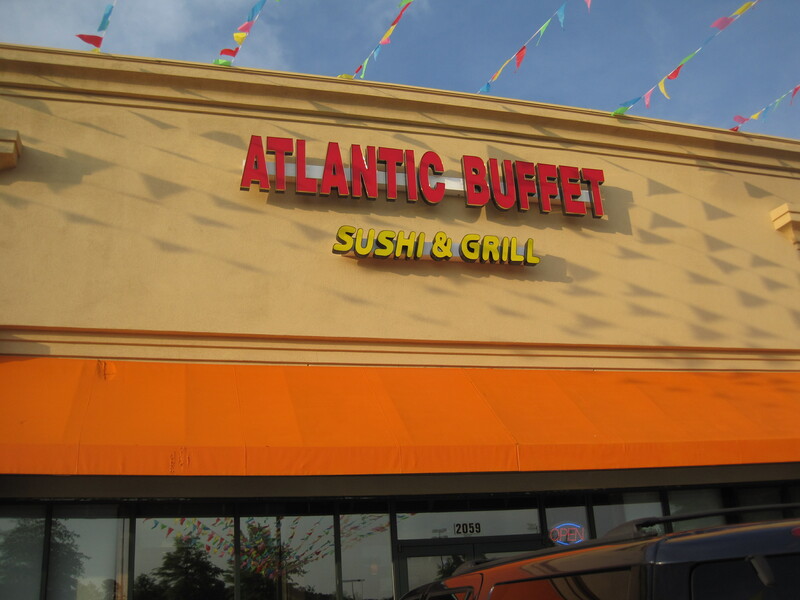 There is a hint of the old Badayori in Atlantic Buffet Sushi and Grill. 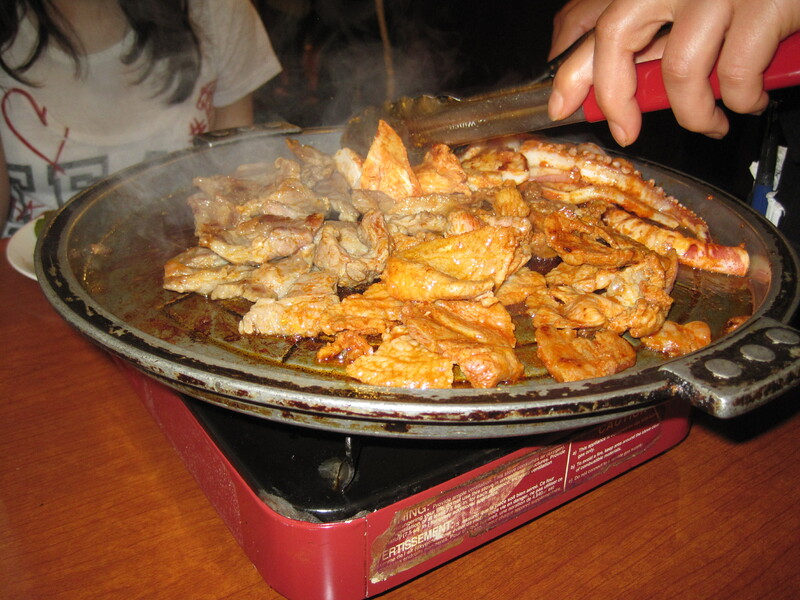 This is a restaurant that pays attention to appearances, and whose foods are well displayed. It’s only a hint though. There is none of the air of “conspicuous consumption” that drove some of Badayori’s over the top offerings. No “palm heart” salads, no plates of artichoke hearts. The sushi range from surprisingly good to surprisingly confusing. 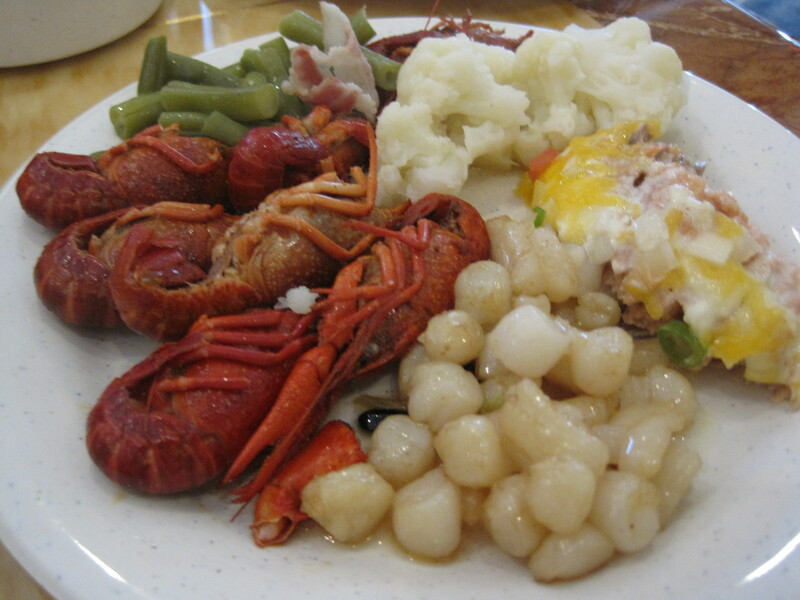 Unlike Badayori, which had excellent consistency in the beginning, the classic Chinese buffet dishes in the Atlantic Buffet are sometimes good and sometimes ordinary. The crawfish lacked spice. Cauliflower were overcooked. The scallops with black bean sauce were shockingly devoid of black beans. This place truly shines, though, when you get to the line of their grilled foods, especially the mushrooms, zucchini, and mackerel. The mackerel, especially, is amazingly good. We went back for seconds and thirds on Atlantic’s line of grilled foods. It’s inexpensive for this kind of eating. $10.99 per adult, with soft drinks $1.59 each. 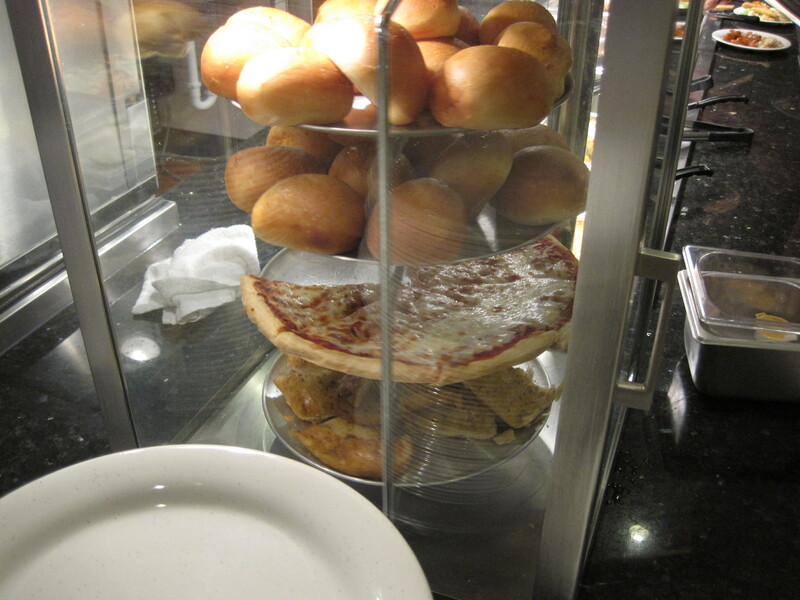 The breads are good here, and they keep warm rolls in a carousel, along with slices of pizza. It’s clear they’re just getting started, and the service, though, is really excellent. Plates disappear from tables and people are around, refilling drinks constantly. Highly recommended. Get here fast. 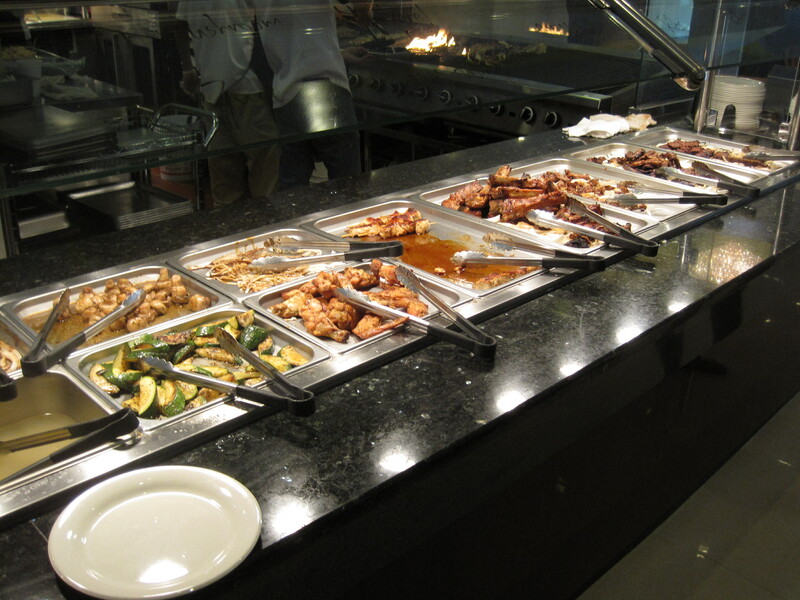 Buffets arrive in “blow you away” fashion and can change on a dime. 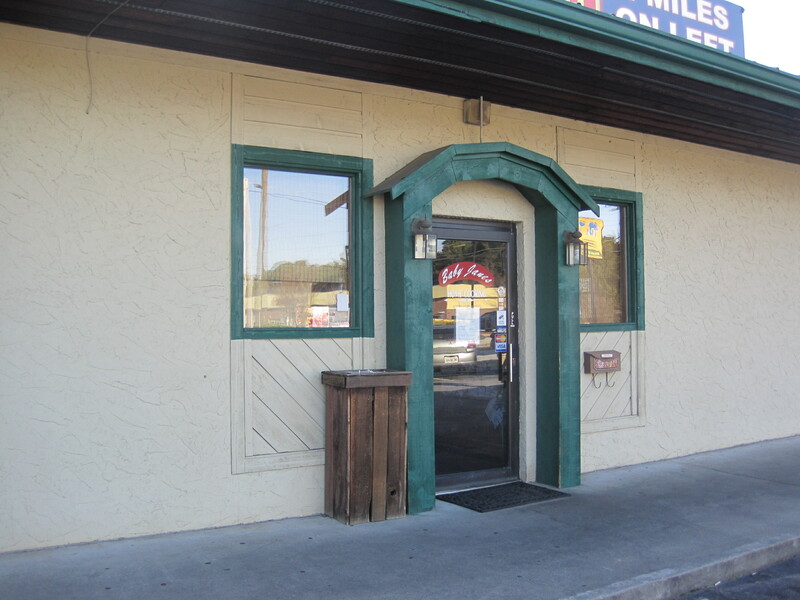 I haven’t found a replacement for this restaurant as of yet. 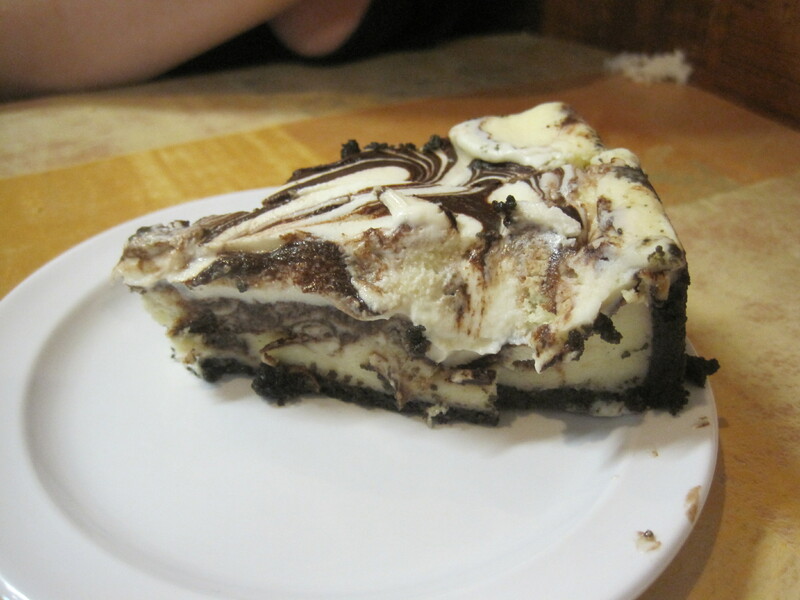 A major family favorite (reviews here and here. Tasty Chomps reviews it here, and Patagonian Toothfish reviews it here), Cho Won has a broad selection of meats, and rather than having it delivered to your table, you choose it yourself. 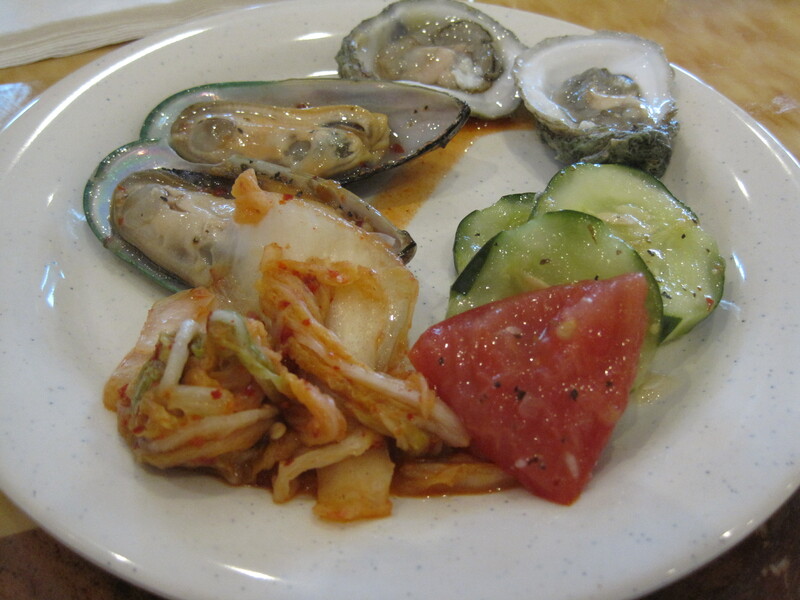 And sometimes, when you’re just had your fill of the fattier side of Korean meats, only some personally cooked seafood will do. This day, shrimp was also available to barbecue.